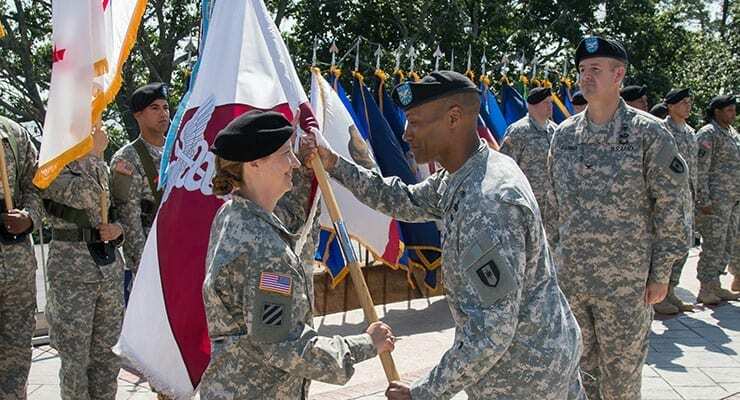 Col. Patrick M. Garman relinquished command of the 1st Area Medical Laboratory (1st AML), to Col. Laura M. Elliot at a ceremony held July 10, 2015 on Aberdeen Proving Ground, Md. Part of the 44th Medical Brigade and 20th CBRNE Command (Chemical, Biological, Radiological, Nuclear, Explosives), the 1st Area Medical Laboratory deployed to Liberia in October 2014 to help to contain the worst Ebola outbreak in history. 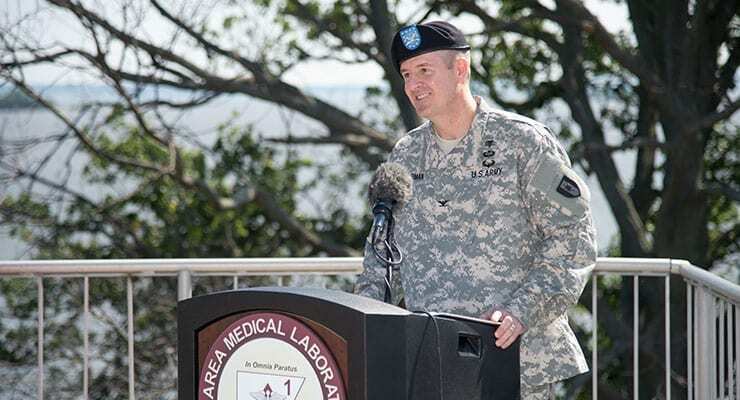 Col. Michael J. Talley, the commander of the Fort Bragg, North Carolina-based 44th Medical Brigade, praised Garman for his accomplishments during his two years in command of this one-of-a-kind U.S. Army formation. “The expeditionary capabilities this combat multiplier brings to the fight are state-of-the-art and have revolutionized the way we protect the force through disease surveillance and analytical laboratory testing and validation for environmental, endemic and CBRNE threats,” said Talley. 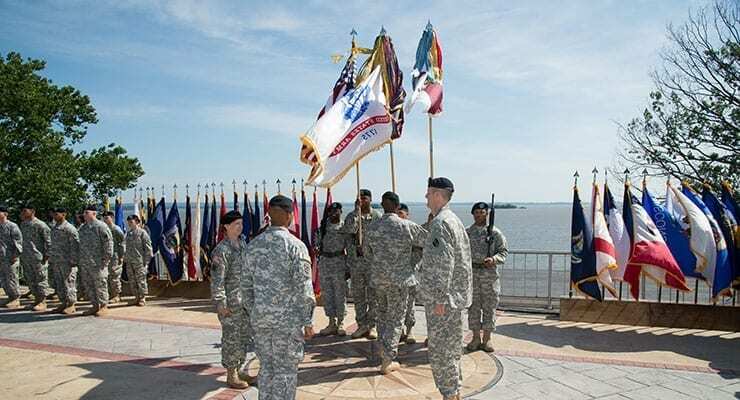 “The 1st AML provides these services for our joint, interagency, intergovernmental and multinational partners in both garrison and combat environments, as well as disaster relief and humanitarian operations,” said Talley. Garman commanded Task Force Scientist during the 1st AML deployment to West Africa. Made up of microbiologists and laboratory technicians from 1st AML and the Naval Medical Research Center, the task force also included civil affairs and military police personnel. Task Force Scientist tested Ebola samples at six mobile laboratories and provided same day results to health care providers. “Imagine holding in your gloved hands a sample containing Ebola. That’s what these Soldiers did. That’s when all of those hours of training pay off. These Soldiers paid that training bill before the Liberia mission was even being considered,” said Garman, a native of Troy, Ohio. Following his 1st AML command tour, Garman will report to the U.S. Army Medical Department (AMEDD) School and then take command of the Evans Army Community Hospital on Fort Carson, Colorado. An Iraq veteran, Elliott reports to 1st AML after serving as the chief of the Plans Division at the U.S. Army Office of the Surgeon General and U.S. Army Medical Command. “To the mighty 1st AML, your success in Liberia is very well known and I’m so excited to be joining this great team,” said Elliott, who is from North Judson, Indiana.